Plate 16 from the fifth set of Thomas and William Daniell's 'Oriental Scenery' called 'Antiquities of India.' This temple was built in 1439 on the top of a rocky outcrop near Madanpur in western Bihar and consecrated to Krisna as Jagannatha. 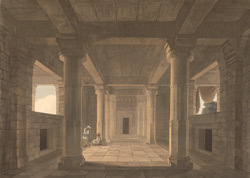 The interior has pillars with polygonal and rounded shafts. .